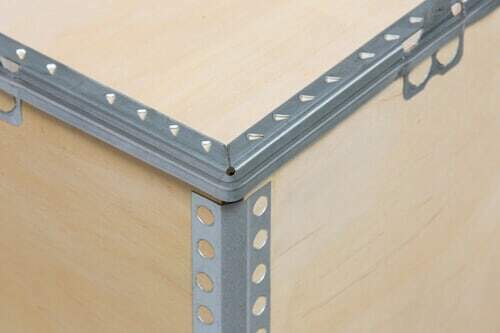 NO-NAIL BOXES - 100% recyclable packaging in plywood and steel! As producers of responsible packaging, sustainable development in general and particularly recycling are key concerns for NO-NAIL BOXES. Not only has the company implemented a programme on waste prevention, management and reduction internally, but the collapsible boxes it produces are also easily recyclable. All collapsible boxes produced by NO-NAIL BOXES are 100% plywood and steel. These two materials make recycling them particularly easy when customers no longer can or want to use them. To ensure correct recycling of the boxes, NO-NAIL BOXES advises its customers to contact their usual local waste management facility to arrange for collection of the boxes to be recycled. The boxes will be taken to a recycling/upgrading plant where they will be crushed before their plywood and steel components are automatically separated. The steel particles can be easily recovered by magnetisation. The wood will, for example, be used for electricity and heat generation while the steel will be given a second life. One shuttle crate can replace 50 packages! NO-NAIL BOXES provides purpose-made boxes for the shuttles. The plywood boxes are eight times stronger than cardboard packaging and can be reused many times. One shuttle crate can replace 50 non-returnable packages! This is, therefore, an economical and ecological advantage. It is a responsible packaging solution, ideal for logistical loops and optimising empty returns. The collapsible boxes by NO-NAIL BOXES comply with European legislation. 100% recyclable and reusable, they are fully in line with Directive 94/62/EC on packaging and packaging waste. This law provides for measures aimed at reducing the production of packaging waste, promoting recycling, reuse and other ways of upgrading this waste. Final disposal of these items should only be considered as a last resort.